Việt Nam (Vietnamese pronunciation: [vjə̀tnam]) was the name adopted by Emperor Gia Long in 1804. It is a variation of "Nam Việt" (南越, Southern Việt), a name used in ancient times. In 1839, Emperor Minh Mạng renamed the country Đại Nam ("Great South"). In 1945, the nation's official name was changed back to "Vietnam". The name is also sometimes rendered as "Viet Nam" in English. The term "South Vietnam" became common usage in 1954, when the Geneva Conference provisionally partitioned Vietnam into communist and non-communist parts. 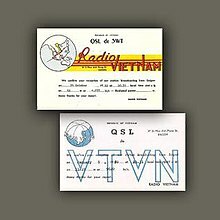 In July 1955, Diệm announced in a broadcast that South Vietnam would not participate in the elections specified in the Geneva accords. As Saigon's delegation did not sign the Geneva accords, it was not bound by it. He also said the communist government in the North created conditions that made a fair election impossible in that region. This view was supported by the International Control Committee, in the circumstances prevailing in 1955 and 1956 – anarchy of the Sects and of the retiring Viet Minh in the South, the 1956 campaign of terror from Hanoi's land reform and resultant peasant uprising around Vinh in the North. 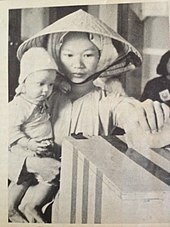 Diệm held a referendum on 23 October 1955 to determine the future of the country. He asked voters to approve a republic, thus removing Bảo Đại as head of state. The poll was supervised by his younger brother, Ngô Đình Nhu. Diệm was credited with 98 percent of the votes. In many districts, there were more votes to remove Bảo Đại than there were registered voters (e.g., in Saigon, 133% of the registered population reportedly voted to remove Bảo Đại). His American advisors had recommended a more modest winning margin of "60 to 70 percent". Diệm, however, viewed the election as a test of authority. On 26 October 1955, Diệm declared himself the president of the newly proclaimed Republic of Vietnam. The French, who needed troops to fight in Algeria, completely withdrew from Vietnam by April 1956. Many feel that [Diem] is unable to rally the people in the fight against the Communists because of his reliance on virtual one-man rule, his tolerance of corruption extending even to his immediate entourage, and his refusal to relax a rigid system of public controls. The Diệm government lost support among the populace, and from the Kennedy administration, due to its repression of Buddhists and military defeats by the Viet Cong. Notably, the Huế Phật Đản shootings of 8 May 1963 led to the Buddhist crisis, provoking widespread protests and civil resistance. Diệm was overthrown in a coup on 1 November 1963 with the tacit approval of the US. On 15 March 1973, US President Richard Nixon implied that the US would intervene militarily if the communist side violated the ceasefire. Public reaction was unfavorable, and on 4 June 1973 the US Senate passed the Case–Church Amendment to prohibit such intervention. The oil price shock of October 1973 caused significant damage to the South Vietnamese economy. A spokesman for Thiệu admitted in a TV interview that the government was being "overwhelmed" by the inflation caused by the oil shock, while an American businessman living in Saigon stated after the oil shock that attempting to make money in South Vietnam was "like making love to a corpse". One consequence of the inflation was the South Vietnamese government had increasing difficulty in paying its soldiers. The Viet Cong resumed offensive operations, and by January 1974 it had recaptured the territory that it had lost earlier. After two clashes that left 55 South Vietnamese soldiers dead, President Thieu announced on 4 January that the war had restarted and that the Paris Peace Accord was no longer in effect. There were over 25,000 South Vietnamese casualties during the ceasefire period. In December 1974, the communists of North Vietnam launched an invasion first at Phuoc Long to test two things: how much strengths and weaknesses the ARVN soldiers preparedness on the elevated terrain combat and the U.S military response on PAVN invasion. When U.S unable to send soldiers to South Vietnam, ARVN soldiers in Phuoc Long couldn't defend much longer siege around the districts near provincial capital Phuoc Long. Mightily PAVN soldiers, with a lot of ammunition and supplies, invade successfully to capture many of districts around provincial capital of Phuoc Long creating the weakening of ARVN resistance at stronghold areas. President Thieu later abandoned Phuoc Long on early January 1975. As a result, Phuoc Long is the first provincial capital fallen by communists North Vietnam. 1974 China attacked South Vietnam in Paracels Islands, it makes South Vietnam's Army become more weaker. They thought they couldn't defend the country from Vietnam Army. Nguyễn Văn Thiệu resigned on 21 April 1975, and fled to Taiwan. He nominated his Vice President Trần Văn Hương as his successor. A last-ditch defense was made by the ARVN 18th Division at the Battle of Xuân Lộc led by Major General Lê Minh Đảo. After only one week in office, Trần Văn Hương handed over the presidency to General Dương Văn Minh ("Big Minh"). Minh was seen as a more conciliatory figure toward the North, and it was hoped he might be able to negotiate a more favourable settlement to end the war. The North, however, was not interested in negotiations, and its tanks rolled into Saigon largely unopposed which led to the Fall of Saigon. Acting President Minh unconditionally surrendered the capital city of Saigon and the rest of South Vietnam to North Vietnam on 30 April 1975. In the Mekong Delta, Can Tho and most of the provinces were intact and strongly kept control by aggressive ARVN soldiers. Many of ARVN soldiers were strong morale on the last days of South Vietnam to prevent VC taking over any provincial capital. Despite VC skirmishes attacks, many of ARVN units manage to defend many important places for days until President Minh ordered ARVN soldiers to disband. When Saigon was about to fell to communists, Brigadier General Le Van Hung planned a secret map places in jungles and military bases that would continue prolong counterattack against VC for few months until PAVN/VC reach a ceasefire hoping to keep several places for South Vietnam. There Hung sent remaining ARVN soldiers and officers to secret places to stabilize across Mekong places. However, when President Duong Van Minh surrender, many of Can Tho residents oppose a strong resistance against outnumbered VC soldiers. Summoning to say goodbye to ARVN soldiers, staffs, and his family, Le Van Hung committed suicide at his bedroom. On the same day, Brigadier General Tran Van Hai, who defend strongly to maintain control in Mỹ Tho and Định Tường province, committed suicide in Dong Tam Base. The next morning, Major General Nguyen Khoa Nam, who direct military operations to protect whole Mekong Delta, committed suicide at IV Corps headquarter in Can Tho. Remaining ARVN soldiers in Mekong Delta later surrender to VC shortly after three ARVN generals suicide. The Geneva Accords promised elections in 1956 to determine a national government for a united Vietnam. In 1957, independent observers from India, Poland, and Canada representing the International Control Commission (ICC) stated that fair, unbiased elections were not possible, reporting that neither South nor North Vietnam had honored the armistice agreement. After promising not to do so during the 1964 election campaign, in 1965 President Lyndon B. Johnson decided to send in much larger numbers of combat troops, and conflict steadily escalated. The NLF ceased to be an effective fighting organization after the Tet Offensive in 1968 and the war was largely taken over by regular army units of North Vietnam. Following American withdrawal from the war in 1973, the South Vietnamese government continued fighting until its unconditional surrender to the Viet Cong on 30 April 1975, the day of the surrender of Saigon. North Vietnam controlled South Vietnam under military occupation, while the Provisional Revolutionary Government of the Republic of South Vietnam, which had been proclaimed in June 1969 by the NLF, became the nominal government. The North Vietnamese quickly moved to marginalise non-communist members of the PRG and integrate South Vietnam into the communist North. The unified Socialist Republic of Vietnam was declared on 2 July 1976. The Embassy of the Republic of Vietnam in Washington donated 527 reels of South Vietnamese-produced film to the Library of Congress during the embassy's closure following the Fall of Saigon, which are in the Library to this day. In 1965, the feuding civilian government voluntarily resigned and handed power back to the nation's military, in the hope this would bring stability and unity to the nation. An elected constituent assembly including representatives of all the branches of the military decided to switch the nation's system of government to a Semi-Presidential system. There was a bicameral National Assembly consisting of a Senate and a House of Representatives, which came into being in 1967. Military rule initially failed to provide much stability however, as internal conflicts and political inexperience caused various factions of the army to launch coups and counter-coups against one another, making leadership very tumultuous. The situation within the ranks of the military stabilised in mid-1965 when the Republic of Vietnam Air Force chief Nguyễn Cao Kỳ became Prime Minister, with General Nguyễn Văn Thiệu as the figurehead chief of state. As Prime Minister, Kỳ consolidated control of the South Vietnamese government and ruled the country with an iron fist. In June 1965, Kỳ's influence over the ruling military government was solidified when he forced civilian prime minister Phan Huy Quát from power. Often praising aspects of Western culture in public, Ky was supported by the United States and its allied nations, though doubts began to circulate among Western officials by 1966 on whether or not Ky could maintain stability in South Vietnam. A repressive leader, Ky was greatly despised by his fellow countrymen. In early 1966, protesters influenced by popular Buddhist monk Thích Trí Quang attempted an uprising in Quang's hometown of Da Nang. The uprising was unsuccessful and Ky's repressive stance towards the nation's Buddhist population continued. The South Vietnamese government was regularly accused of holding large quantity of political prisoners, of which the exact number was a source of contention. Amnesty International, in a report in 1973, gave the estimation of number of South Vietnam's civilian prisoners ranging from 35,257 (as confirmed by Saigon) to 200,000 or more. Among them, approximately 22,000–41,000 were accounted "communist" political prisoners. Robert F. Turner disputed the figure of 200,000, claiming the actual number to be "at the worst [...] a few hundred or so." Following the surrender of Saigon to North Vietnamese and Viet Cong forces on 30 April 1975, the Provisional Revolutionary Government of the Republic of South Vietnam officially became the government of South Vietnam. Democratic Republic of Vietnam and Provisional Revolutionary Government of the Republic of South Vietnam were merged to become the current Socialist Republic of Vietnam through the 1976 election, which was held on 25 April 1976. AFVN-TV on Channel 11, operated by Armed Forces Radio and Television Service (now American Forces Network), catered to U.S. troops in South Vietnam. Broadcasting entirely in English, it relayed popular U.S.-made shows like The Ed Sullivan Show and The Tonight Show Starring Johnny Carson, and various sports games like the World Series. It also broadcast news and special announcements from the American government and military commanders. Writing in The Christian Science Monitor in 1970, Dan Sutherland remarked: "Under its new press law, South Vietnam now has one of the freest presses in Southeast Asia, and the daily paper with the biggest circulation here happens to be sharply critical of President Thieu ... since the new press law was promulgated nine months ago, the government has not been able to close down Tin Sang or any other newspaper among the more than 30 now being published in Saigon." South Vietnam maintained a capitalist free-market economy with ties to the West. It established an airline under the Head of State Bảo Đại named Air Vietnam. The economy was greatly assisted by American aid and the presence of large numbers of Americans in the country between 1961 and 1973. Electrical production increased fourteen-fold between 1954 and 1973 while industrial output increase by an average of 6.9 percent annually. During the same period, rice output increased by 203 percent and the number of students in university increased from 2,000 to 90,000. US aid peaked at $2.3 billion in 1973, but dropped to $1.1 billion in 1974. Inflation rose to 200 percent as the country suffered economic shock due the decrease of American aid as well as the oil price shock of October 1973. The unification of Vietnam in 1976 was followed by the imposition of North Vietnam's centrally planned economy in the South. The country made no significant economic progress for the next twenty years. 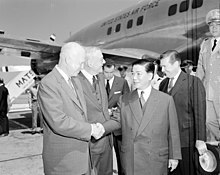 After the break-up of the Soviet Union and the end of Soviet aid, the leadership of Vietnam accepted the need for change. Their occupation armies were withdrawn from Laos and Cambodia. Afterward, the country introduced economic reforms that created a market economy in the mid-1990s. The government remains a collective dictatorship under the close control of the Communist Party. A 2017 study in the journal Diplomatic History found that South Vietnamese economic planners sought to model the South Vietnamese economy on Taiwan and South Korea, which were perceived as successful examples of how to modernize developing economies. The Vietnamese language was the primary official language and was spoken by the majority of the population. Despite the end of French colonial rule, the French language still maintained a strong presence in South Vietnam where it was used in administration, education (especially at the secondary and higher levels), trade and diplomacy. The ruling elite population of South Vietnam was known to speak French as its primary language. 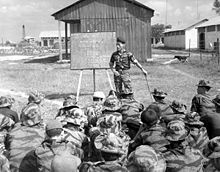 With US involvement in the Vietnam War, the English language was also later introduced to the armed forces and became a secondary diplomatic language. Languages spoken by minority groups included Chinese, Khmer and other languages spoken by Montagnard groups. The religion of the majority of the population was Buddhism influenced by Confucian philosophy, which was practiced by about 80% of the population. ^ Konrad G. Bühler (2001). State Succession and Membership in International Organizations: Legal Theories Versus Political Pragmatism. Martinus Nijhoff Publishers. pp. 71. ISBN 978-90-411-1553-9. ^ George S. Prugh (1975). "Application of Geneva Conventions to Prisoners of War". VIETNAM STUDIES : LAW AT WAR: VIETNAM 1964–1973. lawofwar.org. ^ Robert C. Doyle (2010). The Enemy in Our Hands: America's Treatment of Enemy Prisoners of War from the Revolution to the War on Terror. University Press of Kentucky. p. 269. ISBN 978-0-8131-2589-3. ^ "The End of South Vietnam". .
^ a b L. Shelton Woods (2002). Vietnam: a global studies handbook. ABC-CLIO. p. 38. ISBN 978-1576074169. ^ A. Dirk Moses (2008). Empire, Colony, Genocide: Conquest, Occupation, and Subaltern Resistance in World History. Berghahn Books. p. 213. ISBN 978-1845454524. ^ "Maintenance Agency for ISO 3166 country codes - English country names and code elements". ISO. 6 April 2010. Retrieved 28 April 2010. ^ a b Ang Cheng Guan (1997). Vietnamese Communists' Relations with China and the Second Indochina War (1956–62). Jefferson, North Carolina: McFarland. p. 11. ISBN 978-0-7864-0404-9. ^ Woodruff, Mark William (1 October 2005). Unheralded Victory: The Defeat Of The Viet Cong And The North Vietnamese Army, 1961-1973. Ballantine Books. ISBN 9780891418665 – via Google Books. ^ Duncanson, Dennis J. Government and Revolution in Vietnam. New York: Oxford University Press, 1968. tr 223: "In the circumstances prevailing in 1955 and 1956 – anarchy of the Sects and of the retiring Viet Minh in the South, terror campaign of the land reform and resultant peasant uprising round Vinh in the North – it was only to be expected that voters would vote, out of fear of reprisals, in favour of the authorities under whom they found themselves; that the ICC had no hope of ensuring a truly free election at that time has been admitted since by the chief sponsor of the Final Declaration, Lord Avon." ^ Karnow 1997, p. 239. ^ "The Vietnam War: Seeds of Conflict: 1945–1960". historyplace.com. ^ "The History Place - Vietnam War 1945-1960". www.historyplace.com. ^ a b Sheehan, Neil; Smith, Hedrick; Kenworthy, E. W.; Butterfield, Fox (12 December 2017). The Pentagon Papers: The Secret History of the Vietnam War. Skyhorse Publishing Inc. ISBN 9781631582936. ^ "Battle of Phuoc Long Begins". World History Project. Retrieved 9 April 2019. ^ "Fall of Saigon - 1975 Year in Review - Audio - UPI.com". UPI. ^ "Holdouts". War Never Dies. Retrieved 7 April 2019. ^ "Five Generals | Freedom For Vietnam". Retrieved 7 April 2019. ^ Woodruff, Mark (2005). Unheralded Victory: The Defeat of The Viet Cong and The North Vietnamese. Arlington, Virginia: Presidio Press. ISBN 0-8914-1866-0. P.6: "The elections were not held. South Vietnam, which had not signed the Geneva Accords, did not believe the Communists in North Vietnam would allow a fair election. In January 1957, the International Control Commission (ICC), comprising observers from India, Poland, and Canada, agreed with this perception, reporting that neither South nor North Vietnam had honored the armistice agreement. With the French gone, a return to the traditional power struggle between north and south had begun again." ^ Johnson, Victoria E. "Vietnam on Film and Television: Documentaries in the Library of Congress". University of Virginia. Retrieved 31 December 2013. ^ a b c d David Farber (2004). The Sixties Chronicle. Legacy Publishing. p. 273. ISBN 978-1412710091. ^ a b c David Farber (2004). The Sixties Chronicle. Legacy Publishing. p. 232. ISBN 978-1412710091. ^ David Farber (2004). The Sixties Chronicle. Legacy Publishing. p. 264. ISBN 978-1412710091. ^ Report No. ASA 41/001/1973, "Political Prisoners in South Vietnam", Amnesty International, 1 January 1973, p. 6-8. ^ a b Turner, Robert F. (1990). "Myths and Realities in the Vietnam Debate". The Vietnam Debate: A Fresh Look at the Arguments. University Press of America. ISBN 9780819174161. ^ Administrator. ":: Lich su Viet Nam". www.lichsuvietnam.vn. ^ a b Kim, Youngmin, "The South Vietnamese Economy During the Vietnam War, 1954–1975"
^ a b Wiest, Andrew A., The Vietnam War, 1956–1975, p. 80. ^ Toner, Simon (1 September 2017). "Imagining Taiwan: The Nixon Administration, the Developmental States, and South Vietnam's Search for Economic Viability, 1969–1975". Diplomatic History. 41 (4): 772–798. doi:10.1093/dh/dhw057. ISSN 0145-2096. 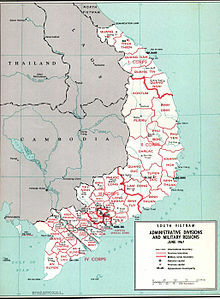 Wikimedia Commons has media related to South Vietnam.